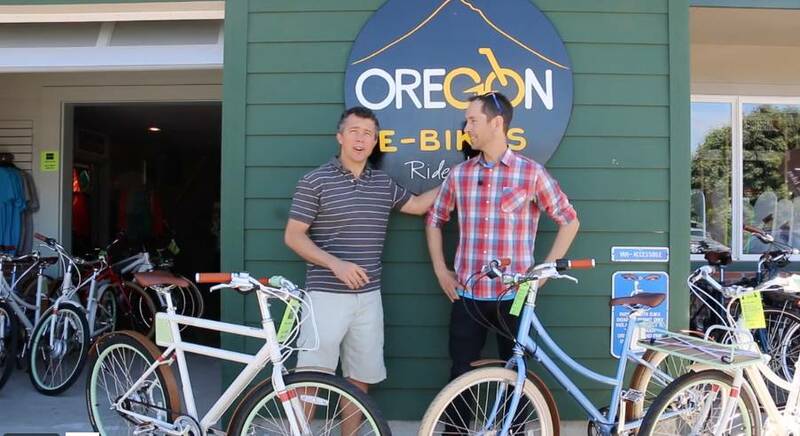 Faraday Founder and CEO Adam Vollmer pays Oregon E-Bikes a visit and fills Matt in on his secrets to success. Why Faraday Electric Bikes? from Big Winds on Vimeo. Matt: Hey! Matt with Oregon E-bikes here, with Adam Volmer from Faraday. He's the CEO and founder, and we're really excited to have you here. Thanks for coming Adam. Adam: Absolutely. Yeah, it's great to be here. Matt: Adam, we're just going to jump right into it. Could you please tell me, where did Faraday come from? How did you have the idea or give me the background on Faraday. Adam: Yeah, it's a great story. We basically set out to build a great bike for every riding, riding the city, commuting, going to the grocery store, and we got excited about electric. We realized that with a motor, you could ride, you could go faster, you'd get less sweaty, you'd conquer that one hill that everyone's got on their hill. We looked out there, and we realized that a lot of the stuff on the market with electric, it was big. It was heavy. The experience kind of didn't feel like riding a bike, and we all love that feeling of riding a bike. We have that from a kid. It's kind of in our DNA, and we wanted to, I think, amplify that feeling of like just that great feeling you get in a bike instead of taking away with the electric. So we really wanted to just boost that feeling. So we set out to build bikes that were lightweight, simple, real easy to use, and beautiful. Beautiful history of design, and we wanted to capture it. This is where we ended up, and we love what we have. Matt: It's so cool because we tested a lot of bikes when we decided what bikes to bring into Oregon E-Bikes, and we got these Faradays. Then was when testing before we bought them, and they felt different. What sets Faraday apart? Why do you get on and it just feels like such a nice, smooth ... I just want to ride it to the pub, and it's such a nice summer bike. What makes them different from basically every other e-bike. Adam: The big part of that is we did it the hard the way. To be kind of honest, we said what was out there on the market for motors and drive systems didn't just kind of capture that feeling that you just described right there, and so we built almost every single part of these bikes from scratch. The battery, the lights, the firmware, the software. We spent tons and tons and tons of time just kind of obsessing over this stuff. We built nine different versions of a fork to get the exact right feel so that it felt fun and quick and responsive, but stable. And we just went crazy on all those details, and the end result is we've got something that's really unique. It's not like any other bike on the market. It is kind of unique to us, but it's truly build literally every single part of the bike from the ground up just to be a great riding e-bike. Matt: We always get the question. These bikes are so light. They don't look like e-bikes. Where's the battery? Where's the motor? What's going on? Adam: Yeah, it's funny. We kind of have fun with that on our website. We make people kind of guess where the battery is, and people get it wrong all the time. SO the battery is right here in the down tube. It's kind of a long tube. It's a Panasonic cell, super high quality. The same thing you'd see on a high-end electric car. We're really proud of our battery. I have to brag for a moment. It's really cool tech. We actually have the highest energy density of any e-bike battery on the market. Matt: Really? I didn't know that. Adam: We cram so much technology and power into that little thing, and that's why that bike is so small, so svelte, and so light. And that's kind of a little-known fact about Faraday that we don't make a big deal about, but we're actually pretty proud about that. So the battery's there in the down tube on all the bikes. Matt: A lot of people think this is the battery. Adam: Yeah, the controller in the back? No, this is the brain. So that's kind of the ... It's really like a little ... It's actually a couple little computers in there. That's a huge part of that really cool, unique smooth feel of the assist, and we spent just countless hours of really dialing the program in. Matt: Cool, and what about the motor? From our shop, it's the only bike that we have with a front hub motor. How does that differ from a rear hub or a center drive motor? Adam: Yeah, sure. So motor is confusing. You've got a lot of different options in the market. Rear hub, front hub, center drive. I like to tell people there's no best motor for every purpose. Just like you'd never say every car should be a convertible or every car should be all wheel drive. For this bike, what we set out to do was build a light-weight, super-fun, efficient, silent bike that looked beautiful and that hid its technology. A hub motor, especially a front hub motor, is perfect for that because it's lightweight and super, super efficient. It's actually got quite a lot of torque to geared hub motors. Especially in these bikes, it lets us run and turn the geared hub in the back there, so that turned geared hub is super-nice, low maintenance, has a great feel to it, and really balances the weight. When you pick the bike up, neither the front nor the back weighs a ton. Matt: Makes sense, I didn't think of that! Adam: It has a really nice balanced feel, and that helps when you ride it for sure. You feel that in the ride. And even just picking it up, getting it up a curb, moving it around. We think, again, for this bike, this thing is just perfect. And again, back to that whole system. We didn't just slap this thing on there. We really, really, really dialed the system in to work perfectly well with that motor. Matt: Adam, we loved having you here. We can't wait to get more people on Faradays. You really get to feel them to really understand how fun they are to ride. Just love them. They were also voted in the top 3 in Outside Magazine of All E-bikes. Did you know that? Adam: I did. It was actually kind of a fun story. They liked it so much, the editor actually bought that bike we sent them. Matt: Like paid for it? Adam: Yes. He said 'we don't want to give it back'. So, yeah. Come check them out. Such a beautiful ride. You guys have a great spot here. Matt: Come on down to Oregon E-Bikes. We'll get you on a Faraday, and you'll fall in love and have a great time. Thanks for joining us! Scott E-Sub Activs are Here!